It has been 6 weeks withouth writing anything in my blog. Thanks Heavens, today is Friday and I have finally finished everything many things that I had to do. I finished teaching 2 weeks ago. Most of teaching hours were devoted to the second year class of the Geography undergrad. I also tood a study trip to Barcelona (that was the previous post, a draf I had form October). I’m also supervising a group of visiting students from Hannover. They’re pretty smart. Something about teaching I like to pass in the last class a questionnare to give me feedback. I’m quite glad because my average evaluation has improved from last year. I think that the changes that I have introduced have been good, but I still have to refine many things for next semesters. Last year was my first year teaching in Denmark. It’s fine teaching the vast majority in English, but of course it’s a problem because that’s my second language and the students one. But I think the main problem comes from cultural differences. I have been mostly educated in Spain, and I know how the systems works. Also I have totalled four semester in the U.S., and I was a teaching assistant at Georgia Tech, so I know they system well to. By the way, out of the 5 other T.A.’s that I consult, I think the students highly pleased with me. But Denmark… is the culture. I studied here for 2 semester during my masters, but still sometimes is hard, and perhaps here in Aalborg is more challenging. Oh, well. We all have to learn. Study Field to Barcelona city region. In the first week of October I went with the third year students of Geography to Barcelona. On the second year they Geography students they travel somewhere in Denmark, and the third year they go abroad. In previous years they have gone to Germany or the Netherlands. This year they assigned me to go somewhere and they suggested Spain. I’m from Madrid, and perhaps I should have gone there, but I though it would be interesting to go there and students will enjoy it more during their free time. (I think they did enjoy having almost 30 degrees and go to the beach!). I also wanted to visit some people at the University there. It was an interesting experience. I think overall they liked it. We learn many things regarding, planning, socioeconomic factors, environment, economic geography, and of course learning from a different culture (for them, and a little bit for me :) I think they were also very good students, not only in general, but during the trip. I’m looking forward next year. Comments Off on Study Field to Barcelona city region. I’m co-teaching the class of “Theories of the Firm and of Entrepreneurship” with Søren Kerndrup. Actually he’s the professor and I’m the apprentice. He always has the right readings, and suggested this book for the two classes I teach. This class is directed for engineers or geographers without a limited education on economics and business studies. So, my job is trying to teach them some of it, and I think this book is very good to do that. Text: In my opinion Julien gets to the core of entrepreneurship with this book. He presents theoretical concepts in a clear way and it’s probably one of the best books to understand entrepreneurship. I don’t fully agree with some of the conclusions of the book, but he has really made me think about many things I had never considered. Overall very good. By the way, you can find it in Google books or even better in Scribd, which is REALLY nice in order to cut and paste the graphs for the power point presentations (using ctrl+prt sc and pasting it in microsoft paint). This semester I’m not teaching too much, compared with the last semester when I thought a dozen of classes. This is nice as I can concentrate more on the PhD project. The economy today… hard subject to teach! 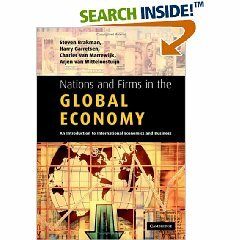 When teaching about the current economics or using the book Global Shift, which focuses in the constant changing, one needs to keep pace with the economy. One has to admit that following the economy today, it’s not that easy. It’s especially hard if you rely on the mainstream media, or media with strong ties to financial groups (corporate media, anyone?). The noise gets much worse when we’re a month from the presidential election in the USA. To sum up, I would just say, that in my opinion, there is too much focus on the housing market, when the root of the problem has been actually reckless investing and of course the trillionare debt. One would recommend to the US cutting a little bit on military expenditures, but then that would look anti-American. I just hope for the best for the US economy. Oh, well, keeping updated economics powerpoint slides seems impossible today. My supervisor gave me the first book that I will be using to teach this Autumn Semester. I will be teaching things related to geography. Because of my background in Business and Economics I will be teaching in the geography group more things related to Economics. It’s not the first time I teach. I was an Spanish teacher for more than 2 years in Spain, in my early university years. That was a side job, not related with my studies but it was fun and well paid for a few hours. Then at the School of Public Policy at Georgia Tech in the Autumn semester 2006, I was also a TA (Teaching Assistant) for a class that combined Science, Technology and Politics with Hans Klein. But anyways although I a little experience teaching, now I’m really excited. I think this is one the better things for a PhD fellow to be able to teach other students. Now I need to learn by heart the first 6 chapters. It’s going to be cool. Oh, next week I will be in Spain for vacations. I have been really missing it this week with the running of the bulls in Pamplona. Now, let me tell you, that’s a real experience! !